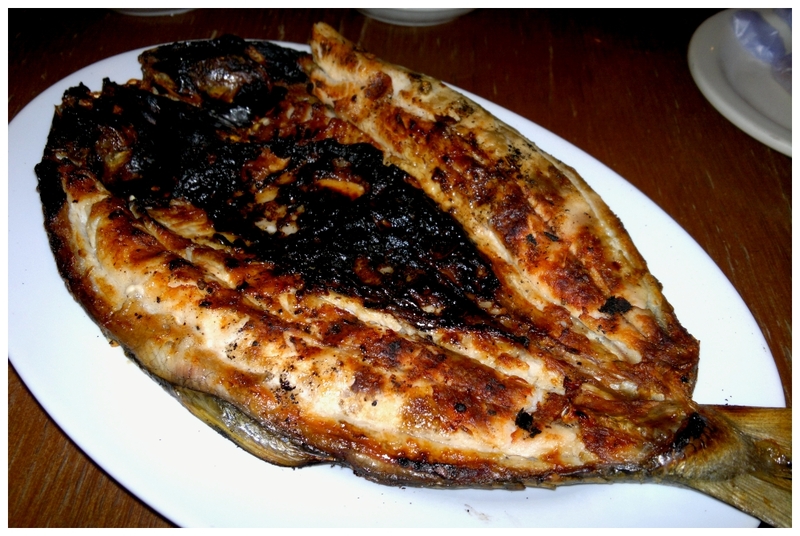 DAGUPAN CITY, Pangasinan - Bangus (milkfish) is the main product of Dagupan City and is claimed to be the tastiest in the world. There's no better time to have your first taste of Dagupan Bangus than during the annual Bangus Festival and there is no better place to feast on Dagupan Bangus dishes than in Bonuan-Tondaligan district of the city. Matutina's Seafood House & Restaurant is one of the many seafood restaurants in Bonuan Tondaligan and probably the best in the area. From its first branch in Bonuan Tondaligan, Matutina's already has a number of branches. Chefs consider bangus a very versatile meat that it can be cooked in more that a hundred ways. Matutina's for example takes pride in its sinigang na bangus belly (milkfish belly in tamarind soup). We also heard restaurants in Dagupan serving bangus sisig and even bangus pizza. But for his first taste of Dagupan bangus, Ramil wanted it plain and simple, a dish in which the natural flavor of the fish is preserved and not overpowered by spices and seasonings - the inihaw na bangus (grilled milkfish), see image above. If bangus were to be compared to gold, then Matutina's inihaw na bangus would be a 24 karat gold. So to answer the question, is Dagupan bangus the tastiest in the world? The answer is, perhaps. But there is one thing we are very sure about, Dagupan bangus is definitely the tastiest bangus we ever had. It was no surpise that, When in Dagupan, eat Bangus, has become Ramil's motto during our trip to Dagupan.